High-efficiency boilers like NTI’s Tft models are seeing more use in retrofit applications than ever before. This is great; a properly installed condensing boiler can cut energy use without compromising comfort and improve the reliability of a home’s heating system. On the surface, these models seem like the perfect fit out of the box, but there’s a little more to it than that. High-efficiency modulating boilers are absolutely an excellent retrofit option, but it’s not as simple as just swapping the equipment out and handling some minor re-piping. When replacing a cast-iron boiler with a state-of-the-art one, spending a little time on system design can go a long way toward optimizing the system for both efficiency and longevity. The most common mistake we come across in these retrofit applications is trusting the gas valve to handle all the heavy lifting. Trinity Fire Tube boilers have an amazing modulating gas valve with an equally impressive turndown ratio. They also have a reduced system volume compared to large cast-iron boilers. A smaller heat exchanger combined with smaller pipes, and typically smaller zones of heating, mean that the amount of water in the average high-efficiency hydronic heating system is less than that of older systems. Since water is the medium through which heat is transferred in hydronic systems, limiting the amount of water in a system affects its heat output. If you try to treat an NTI condensing boiler like a plug-and-play piece of equipment, you could end up creating a system that short cycles and performs worse than the one that you’re replacing. 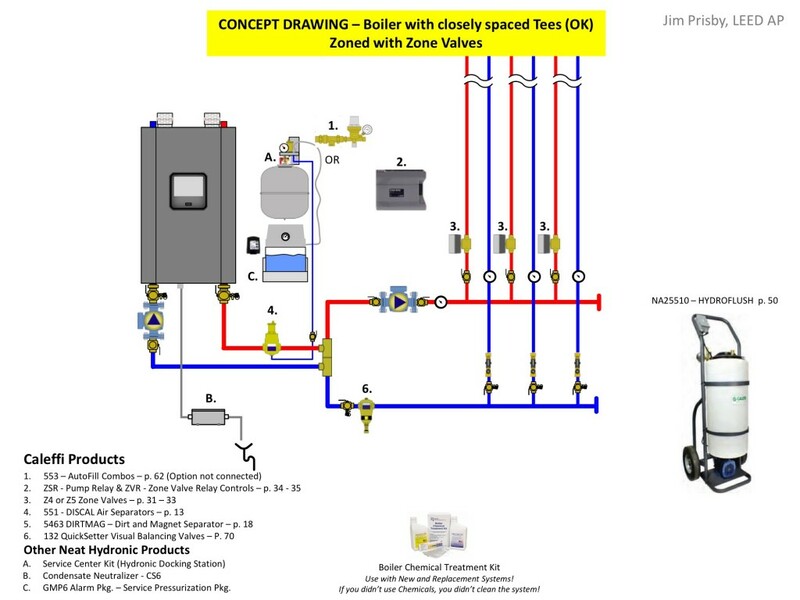 Luckily, we’ve got three killer options for piping big boilers and small zones. If you’re looking for the fastest way to setup a workable primary-secondary circuit, this is a great choice. It will increase the overall volume of your system and you won’t break the bank getting it installed. This is a less-than-ideal setup if your zones of heating are very small, as that could cause short-cycling. We have previously espoused the benefits of Caleffi’s hydraulic separators, and everything said then is just as true now. This setup costs a little more than the one above but it brings a lot more value and utility. 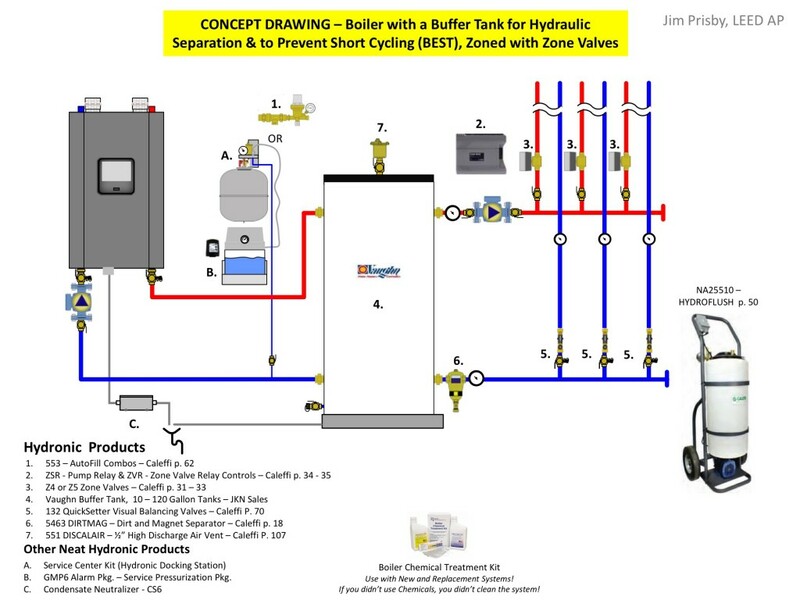 A hydraulic separator will increase the average runtime of the boiler and ensure that the coldest water is being returned to the boiler first. Both of these functions improve efficiency. The hydraulic separator also keeps your system cleaner and it looks nicer on the wall. Our final suggestion utilizes the previous application as a base and adds a buffer tank. The tank further increases system volume and system efficiency. It also provides a location for heated water to be stored before being circulated, allowing the additional heat to be spread through your zones without firing the boiler. Finally, the buffer tank makes it easier to drain sediment and air from the system to keep it clean and running smoothly. 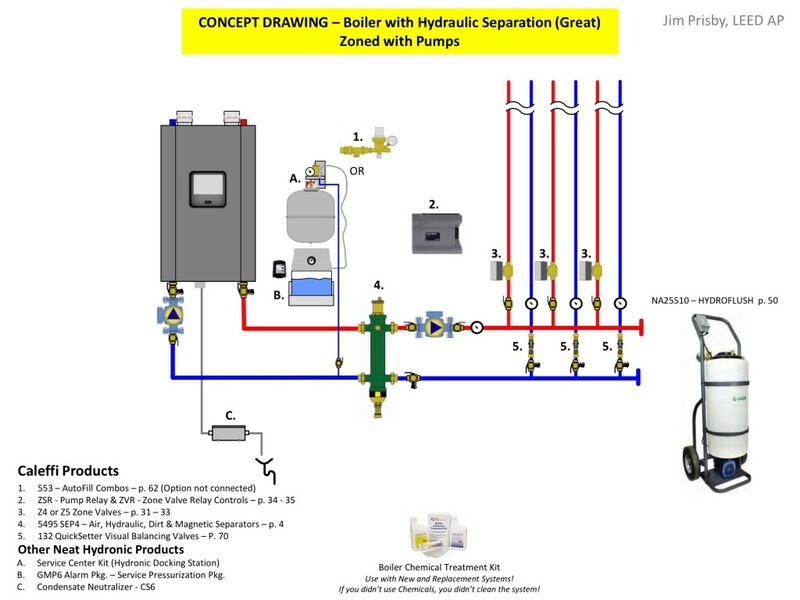 NTI makes the best boilers in the world but you’ll still need the right accessories to optimize hydronic heating in any specific application. Check out our past posts covering hydronics and don’t be afraid to ask for help at any Able location!